I’ll be honest with you guys; it took me 6 days—almost a full week to get over the hangover this book gave me. For those unfamiliar with the term, a “book hangover” is when you finish a book and are still so drawn into its world and tone that starting any other book seems impossible. Nothing satisfies. Food turns to ash in your mouth. Books that once interested you feel like rebound boyfriends that don’t live up because they aren’t that book. 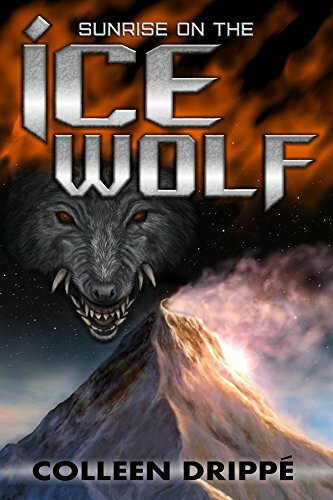 Okay, okay, melodrama aside, Sunrise on the Icewolf has cemented Colleen Drippe as one of my favorite science fiction writers. Not just my favorite among Catholic SF or Catholic fiction, or even my favorite among others this year. Dippe is now up there with Nabokov, Ray Bradbury, and Isaac Asimov. Imagine if Guillermo del Toro regularly wrote creepy cool books instead of making movies and happened to have a pair of ovaries. You’d probably call him Colleen Drippe. The book though? This book is also my favorite of the Star Brothers book series of stand-alone books. The reason this is my favorite was surprising, the main character. Drippe’s books are usually more about creepy cool ambiance, big ideas, and foreign cultures. Individual characters only make a strong impression if they crop up in more than one volume. This isn’t really a flaw though. In many ways, it adds to the almost Germanic-myth ambiance. Given this track record, I was surprised how much I fell in love with Helen Kley Wolfbane. From the first page, I felt I knew her; that I’ve known dozens like her who have lost or never really known a parent. That I’ve known boys and girls who’ve suffered the strain of parents who hate each other and yet, have to hide it because the world tells them their suffering is invalid, their desire to know and love a distant father somehow unnatural or base. Yet despite this indoctrination, Helen dreams of belonging. She yearns to meet and know her father. And this despite, or perhaps because all she has ever known is a cold mother, a resentful “aunt,” (her mother’s girlfriend) and the impersonal isolation of the youth center. This innocent desire leads her to be temporarily taken in by a con artist hoping to kidnap her by impersonating her mysterious father. Helen agrees to meet the man in one of the port cities but quickly realizes her mistake. Luckily she is rescued by two unusually tall foreign men, whom she names Pro and Con for their respective attitudes. After this, she remains in touch with her rescuers like distant online friends. Years later, when she comes of age, she is surprised to find out that her father is a Lost Rythan, and her two rescuers are members of the Faring Guard, that Lost Rythan order of penitent bodyguards for the Church’s missionary Star Brothers. Her father, it turns out, has been missing for two years, and someone or something is out to get him. The kidnapping attempt she escaped as a child was only the first of her trials. Soon she finds herself at the mercy of powers she cannot comprehend. I mean that without exaggeration. In order to free herself and find a home, Helen will have to tap into the strange stalwart power that her Lost Rythan guardians, Pro and Con, seem to draw from their weird archaic religion. Fighting the despair her isolated life has ingrained into her, Helen will have to find a source for a true inner strength that can weather the pull of even the greatest temptations seeking to bend her will to theirs. There is some Chuthlu-level weirdness going on that was very confusing to me but promises to make rereads of this book just as satisfying as the first time around. In fact, I think this might be a good rule of thumb for Drippe’s books. Like Gene Wolfe’s works, be prepared to find new gems and revelations in the rereads. PrevMcCracken and the Lost Lady by Mark AdderleyNextWe started a Podcast!